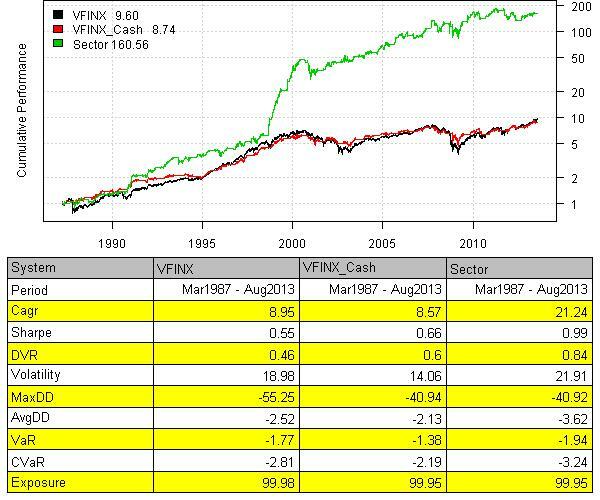 Today I want to show how to back-test the The 7Twelve Portfolio strategy using the Systematic Investor Toolbox. Next, let’s make the The 7Twelve Portfolio strategy with annual/ quarterly and monthly rebalancing. 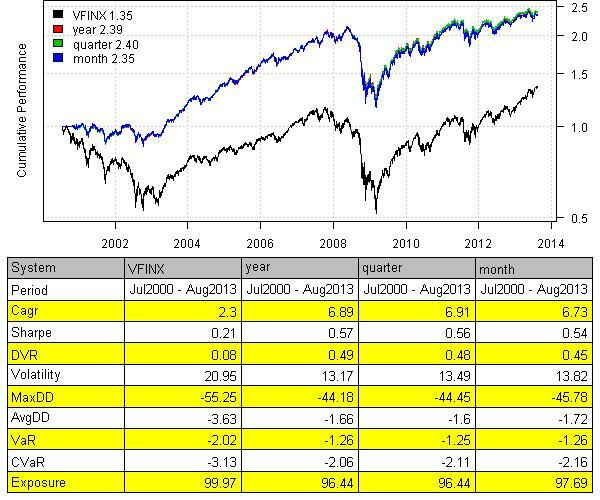 The strategy does better than the Vanguard 500 Index benchmark, but still suffers a huge draw-down in 2008-2009 period. How would you make it a better strategy? Please share your ideas. To view the complete source code for this example, please have a look at the bt.7twelve.strategy.test() function in bt.test.r at github. I recently came across the Kaeppel’s Sector Seasonality Strategy which is described in Kaeppel’s Corner: Sector Seasonality and updated in Kaeppel’s Corner: Get Me Back, Clarence. Buy Fidelity Select Technology (FSPTX) at the October close. Switch from FSPTX to Fidelity Select Energy (FSENX) at the January close. Switch from FSENX to cash at the May close. Switch from cash to Fidelity Select Gold (FSAGX) at the August close. Switch from FSAGX to cash at the September close. Repeat by switching from cash to FSPTX at the October close. # Buy Fidelity Select Technology (FSPTX) at the October close. # Switch from FSPTX to Fidelity Select Energy (FSENX) at the January close. # Switch from FSENX to cash at the May close. # Switch from cash to Fidelity Select Gold (FSAGX) at the August close. # Switch from FSAGX to cash at the September close. # Repeat by switching from cash to FSPTX at the October close. The Technology exposure is surely made a big difference from 1998 to 2000. 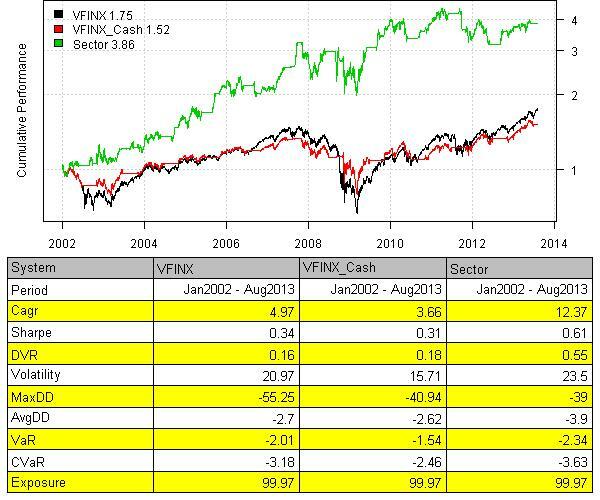 But looking at the strategy perfromance since 2002, the strategy is still doing better than our benchmarks. To view the complete source code for this example, please have a look at the bt.calendar.based.sector.strategy.test() function in bt.test.r at github.